Abraham Lincoln, a congressman at the time, attended the ceremony to lay the cornerstone on July 4th, 1848. The Washington Monument is a large, tall, white obelisk on the National Mall in Washington, D.C. In 1854, money ran low and construction stopped. The monument was about 150 feet high at that point. It was built to commemorate George Washington, once commander-in-chief of the Continental Army and the first President of the United States. Aside from money issues, and the Civil War, construction was halted because anti-Catholic, anti-immigrant activists called Know Nothings were opposed to the Pope Pius IX's donation of black stone for the monument. Standing almost due east of the Reflecting Pool and the Lincoln Memorial, the monument, made of marble, granite, and bluestone gneiss. Stretching 169 meters (555 feet) in the air, the Washington Monument is the tallest thing in the city. The monument is the world’s tallest stone structure and the world’s tallest obelisk. The monument has 50 flights of stairs. It is also the tallest monumental column in the world if all are measured above their pedestrian entrances. The monument's cornerstone included a portrait of George Washington, U.S. coins, a copy of the Constitution and newspapers. Plans for the monument began even before Washington was elected president. In 1783, the Continental Congress voted to erect a statue of Washington, commander-in-chief of the American army during the Revolutionary War, in the nation’s yet-to-be constructed permanent capital city. The monument was once used during a hostage taking. In 1982, a Navy veteran parked his van, with a reported 1,000 pounds of dynamite inside, at the base of the monument. There was a group of tourist stuck inside the monument for hours. When it was over, the Navy vet was shot dead and there were no explosives in his vehicle. However, after Washington became president, he scrapped the plans for his memorial, as federal government funds were tight and he didn’t want to use public money for the project. In 1833, the Washington National Monument Society, a private organization, formed to fund and build a monument to the first president that would be “unparalleled in the world.” The Society solicited for donations and designs for a decade, settling on a design by Robert Mills in 1845. (100-foot) columns and entrance topped by a statue. The design was audacious, ambitious, and expensive, creating numerous complications during its construction. The final design of the Washington Monument was quite different from Robert Mills' design. On July 4, 1848, the monument’s cornerstone (embedded with a box containing such items as a portrait of George Washington, newspapers, U.S. coins and a copy of the Constitution) was laid in a ceremony attended by thousands, including a then little-known U.S. congressman from Illinois, Abraham Lincoln. Construction commenced, but in 1854, with the structure at about 45 meters (150 feet) high, funds ran low and work came to a standstill. Robert Mills also designed the U.S. Patent Office and the U.S. Treasury Building. Finally, in 1876, spurred by the 100th anniversary of America’s founding, President Ulysses Grant authorized federal funding to finish the monument, and work resumed in 1879. By this time, architectural tastes had changed and ring of thirty 30-meter (100-foot) columns and entrance topped by a statue was deleted from the plan. 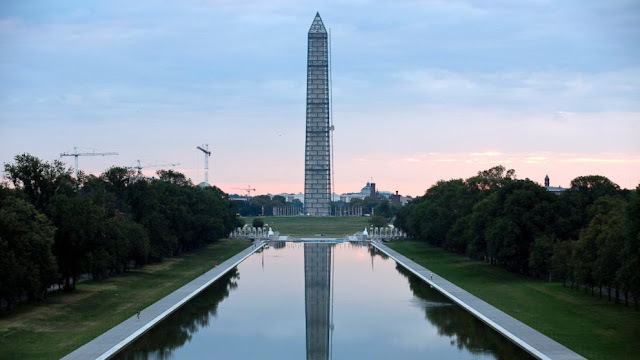 It has become recognizable for its pointed apex, but the Washington Monument was originally designed to bear a flat top. The monument’s design was capped with a pyramid-shaped addition in 1879. Although the stone structure was completed in 1884, internal ironwork, the knoll, and other finishing touches were not completed until 1888. Chief Justice John Marshall held a competition for the monument design and chose Robert Mills' design. George Washington died in 1799, and in 1833, a group began to raise money for the monument. They called themselves the Washington National Monument Society. A difference in shading of the marble, visible approximately 46 meters (150 feet), shows where construction was halted and later resumed with marble from a different source. The total cost of the monument from 1848 to 1888 was $1,409,500. There are many memorials to George Washington, including schools, mountains, highways and cities and one state. The Washington Monument was officially opened October 9, 1888. Upon completion, it became the world’s tallest structure, a title previously held by the Cologne Cathedral. The monument held this designation until 1889, when the Eiffel Tower was completed in Paris, France. When George became president he didn't want to use public money for the monument and killed the project. The above-ground portion is estimated at more than 72,575 tonnes (80,000 US tons). Including the foundation, the structure weighs an estimated 90,718 tonnes (100,000 US tons). The total number of blocks in the monument, including all marble, granite and gneiss blocks, whether externally or internally visible or hidden from view within the walls or old foundation is over 36,000. The number of marble blocks externally visible is about 10,000. Inside the ground floor lobby, there is a statue of George Washington. An elevator provides transportation to the top floor, the 500′ observation deck at the base of the pyramidion. The observation deck provides views out two windows on the north, south, east, and west sides of the pyramidion. A small museum is located on the 490′ level. There is another monument in Baltimore named for Washington that was also designed by Robert Mills. The monument was being planned in 1783, even before George Washington became president. It was being planned as a way to honor Washington as commander-in-chief of the American army during the Revolutionary War. A 897-step stairway connect the observation deck with the ground floor, but they are closed to the public. The interior walls are lined with commemorative stones from individuals, civic groups, cities, states, and countries that wanted to honor the memory of George Washington; some of these stones are visible on the elevator descent trip. The annual visitor count peaked between 1979 and 1997, where an average of 1.1 million visitors visited annually; however, from 2005 to 2010, the Washington Monument has had an average of only 631,000 visitors each year. Fifty American flags (not state flags), one for each state, are now flown 24 hours a day around a large circle centered on the monument. Although the monument was meant to honor George Washington, the first president, it was not completed until the 21st president was already in office. This monument is vastly taller than the obelisks around the capitals of Europe and in Egypt and Ethiopia, but ordinary antique obelisks were quarried as a monolithic block of stone, and were therefore seldom taller than approximately 30 meters (100 feet). An earthquake in 2011 damaged the monument and it has been closed for repair. It is estimated it will cost $15 million and will be reopened in 2014. In 1982, a 66-year-old Navy veteran named Norman Mayer drove to the base of the structure and threatened to blow up the monument with 1,000 pounds (450 kilograms) of TNT unless government officials considered banning nuclear weapons. Several tourists were trapped inside the building, but were later released. The police eventually shot and killed Mayer but when they searched his car for the TNT, they found nothing. President Ulysses Grant ensured that the project continued, beginning again in 1879, by authorizing the use of federal funds for the completion. The monument was damaged during the 2011 Virginia earthquake and Hurricane Irene in the same year and remained closed to the public while the structure was assessed and repaired. After 32 months of repairs, the National Park Service and the Trust for the National Mall reopened the Washington Monument to visitors on May 12, 2014. As of September 2016, the monument has been closed indefinitely due to reliability issues with the current elevator system. It is expected to re-open to visitors in 2019. When the construction was completed, and it opened to the public in 1888, it was just over 555 feet tall and weighed more than 81,000 tons.